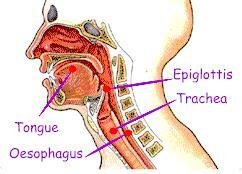 The epiglottis is essentially a trapdoor in your throat. It is an elastic cartilage covered with a mucous membrane located at the entrance of the larynx (voice box) and the base of the tongue. It is shaped like a leaf and guards the entrance of the glottis (the opening between the vocal cords). The epiglottis is one of the nine cartilage structures that make up the larynx and it is covered with taste buds. The upper surface of the epiglottis can be seen through your mouth. What is the function of Epiglottis? What are the problems with Epiglottis and how can are the problems treated? When you swallow food, the epiglottis folds over the glottis to stop liquid and food from entering the trachea (wind pipe). Thus, food goes right to the esophagus so that one would not get choked. It also serves to produce speech sounds in some languages. Two sets of muscles – intrinsic and extrinsic – are responsible for larynx movement. Intrinsic muscles control the vocal cords and speech, while extrinsic muscles control the laryngeal structure and the folding of the epiglottis. When you breathe and do normal activities, the epiglottis sits in an upright position and allows air to pass through the larynx and into the trachea and lungs. When you chew food and swallow, the chewed food reaches the pharynx (throat) and sets off the extrinsic muscles that make the entire larynx move upward. When this happens, the epiglottis touches the base of the tongue and blocks the glottis and the food is directed toward the esophagus. When the food hits the epiglottis, the extrinsic muscles relax and the epiglottis returns to its upright position and the larynx opens. Epiglottitis is when your epiglottis gets inflamed and swollen. Haemophilus influenza type b (Hib) bacteria is usually the cause of epiglottitis, but it can be caused by other bacteria or injury. Epiglottitis is considered a medical emergency because it can restrict the air supply to your lungs and children, in particular, can be vulnerable to it. Less common causes of epiglottitis include fungal and viral infections; trauma to the throat; and smoking illegal drugs such as crack cocaine and marijuana. The onset of epiglottitis is fast, but it can also take up to a few days to develop in adults and older children. Symptoms include difficulty breathing and swallowing; a severe sore throat; excessive drooling; a high temperature of 38ºC (100.4ºF) or above; a hoarse voice; high pitched breathing. Breathing may improve when you lean forward. A swollen epiglottis is very serious because it can restrict oxygen supply to your lungs. Dial 911 immediately if you think you or your child has epiglottitis. While waiting for an ambulance, keep calm. If you have a child who has epiglottitis do not put anything in his or her mouth or attempt to examine the mouth. DO NOT lay the child on his or her back because this could make the symptoms worse. Epiglottitis is treated in the hospital by securing your airway with an oxygen mask or an oxygen tube inserted through your mouth into the trachea. In extreme emergency cases, a tracheostomy is performed allowing oxygen to enter the lungs and bypassing the epiglottis by placing a cut on the front of the trachea and inserting an oxygen tube. Once the airways are functioning, a tube is threaded through the nose and into the windpipe to help you breathe. You or your child will get liquids fed through an IV drip, until you or your child is able to swallow. Once you or your child is breathing, a broad spectrum of antibiotics will be injected into you and once the infection is identified, a specific antibiotic will be used to treat the exact infection. Antibiotics are administered for several days, and most adults and children recover in five to seven days from epiglottitis if the treatment is prompt. Haemophilus influenza type b (Hib) bacteria is usually the cause of epiglottitis and a vaccination since the 1990s has been available; it’s the best way to prevent epiglottitis.